Image: Saint Athanasius, Archbishop of Alexandria (c.296-c.373) … http://albionfourthrome.blogspot.com/2011/01/ .. Image: Young girl making the sign of the cross … https://iamofthestars.files.wordpress.com/2017/10/81a0b-fare_il_segno_della_croce.jpg ..
Video: The Sign of the Cross in Latin, by Stomping Crows … https://www.youtube.com/watch?v=YAcokfQ3cqY ..
Arthur E. Powell has an intriguing passage to do with the ceremony of Baptism, which includes the blessing conferred by the sign of the cross. According to the above passage, a child is born with seeds of evil, which the Catholic Church calls ‘original sin’. The making of the sign of the cross on a young child during the sacrament of baptism, creates an artificial elemental which is like a ‘guardian angel’. This thought form is ‘ensouled’ by a sylph. Image: A sea sylph, http://www.selfgrowth.com/images/Detweiler_image8.JPG .. Image: “Christian Baptismal Sylph — A living being of white flame, shaped like a fiery cross,” by Alice B. Clagett, 15 August 2013, CC BY-SA 4.0 … There is the silhouette of a man, facing forward. In the area of his heart is a fiery cross. In Arthur Powell’s passage referred to above, there’s a description of baptism when practiced by the Liberal Catholic Church. In that ceremony, the priest makes the sign of the cross along the entire body of the child. The thought form so created is referred to, in the pass age as a ‘cuirass’. A cuirass is a defensive armor of the torso. In this case the cuirass is made of white light. Image: Abstract image of a warrior-like figure with a fiery cross of white light on it; the sides of the cross look like wings: https://i.pinimg.com/736x/a1/9a/d0/a19ad07d35d41da266dda6377dda5ca5–alien-art-angels-and-demons.jpg ..
After reading all this, I was really happy that I had been christened (baptized, blessed with the presence of Christ) in my early childhood. Further, in recent years I’ve had an experience of my Sylph activating and bringing forth the love of Christ through my own heart chakra. For me, this is an absolutely glorious experience of ecstasy. This happened, apparently, because the spiritual music being played and sung by the musicians and the congregation in that church, were so very beautiful that my heart was filled to overflowing with joy at hearing it. The mountain of Christed energy I encountered when my Sylph activated had an untoward side effect: The pastor in the Christian congregation where I had been worshiping, along with two ushers, ushered me out of the church, and asked me not to come back. When Christed energy arrives in our lives, it can be disconcerting to other people, as the light of Christ shows, in striking detail, the dark in this world, which had heretofore remained hidden. When those around us see what is before them, in this duality play on Earth, they begin to realize than choices must be made … very important choices for the welfare of their Souls. The choices that lie before us, at each turn of the path, in every second of our waking consciousness, are these: To turn to the Light of Christ, or to fall back into the great slumber of darkness. When each of us begins to rise to the vision of Light and Dark, the first thing that happens is, we feel that someone else has ‘done something to us’ … Someone else has brought beings of darkness into our lives. This, though, is a misapprehension. Instead of blaming or judging others, it’s better to align with Christ, to know that he is with us and will protect us. That is the first step on our Christed journey. Then, should others blame us for what their newly opened eyes begin to see, let us not judge them as they judge us. Let us pray Christ may confer the blessing of his love and light upon them. I say this by way of caveat, as it seems that even a little bit of greater Christ consciousness … as in my case … is always swiftly followed upon by misunderstanding from those around us. If yours is that path, may you will be the more easily able to cope with what may follow, be it joyous or upsetting, from the standpoint of social acceptance. Setting that aside, I would like to end on this happy note: Lately, I’ve noticed that when I practice the sign of the cross my Sylph feels great joy, and my heart chakra energy feels protected and free to express itself in the world. And so, for me, the sign of the cross is the answer to many worldly concerns. Link: “Compendium: Baptismal Sylph,” by Alice B. Clagett, published on 25 February 2019 … https://wp.me/p2Rkym-bNu ..
(2) Explanation of the permanent atoms: “…the essence of the human body (technically ‘bodies’ as each of us has several bodies … physical, astral, mental, buddhic and atmic) is stored in only a few ‘permanent atoms’ and so transported from one lifetime, through the death and afterlife experiences, and then, through reincarnation, back into the physical realm.” — from Link: “Collapsibility, Portability, and Reconstitution of the Human Body,” by Alice B. Clagett, published on 19 September 2014 … http://wp.me/p2Rkym-6mZ ..
(3) See Link: “A Blessing for the Devic Realm” by Alice B. Clagett, published on 18 February 2014 … http://wp.me/p2Rkym-7NP .. This entry was posted in 4th chakra - heart chakra, Angelic realm, Appreciation - gratitude - joy - happiness, Christianity, Demonic realm, Devas - nature spirits - nature elementals, Pariah - outcast - shunning (see also 'Expiation – scapegoating – blood sacrifice'), Prayers - blessings - mantras - affirmations - white magic, Protection - sanctuary, Self-esteem - self worth - ostracism - abandonment, Societal expectations - social contracts, Songs - music - hymns - kirtan and tagged 4th chakra - heart chakra, abandonment, Angelic realm, Arthur E Powell, Arthur Powell, baptism, baptismal sylph, blame, ceremony, Christ consciousness, Christianity, demon realm, devas, heart energy, hymns, judgment, ostracism, outcast, prayers, protecting the heart energy, protection from black magic, protection from demons, Saint Athanasius, seraph, Seraphim, sign of the cross, societal expectations, sylph on 10 October 2017 by Alice B. Clagett. If you find yourself in the questionable position of speaking with a demon or devil, and they make a suggestion, be certain not to agree … because, through a work-around of the logical mind, they assume that, if you agree with them on any reasonable suggestion, then you have ‘bought into’ their realm. I cancel, annul, and tear up all contracts! For the All, through Free Will! The way that demons and devils log onto our innate telepathic processes is similar. They create in the etheric net an arc of energy, from one temple, across the forehead at the level of the third eye-point, and over to the other temple. That’s how they create the illusion that they’re speaking with us. There is a V-shaped energy from the point in the center of the brain where the pituitary and pineal glands are located, to two points on the face: One just between the eyebrows, and one just above them. It’s the activation of the facial points that is one way the demon realm creates the illusion that we’re being mind controlled. It creates the illusion of object-based reality that is so opposite the law of love. The Solution. The solution for this is to place awareness on the third eye-point where it really is: At a point just above the eyebrows, in the center of the head (and not on the face). The power of the third-eye point, and the mastery of self have to do with placing awareness on this center point inside the head. Why do sylphs pair with humans? They do this so that humans can reach the level of spiritual adept by sensing the heart, feeling the heart, and opening it completely. 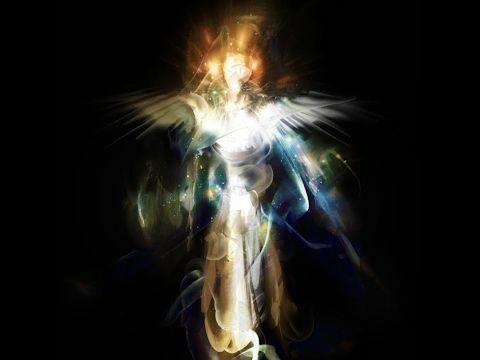 The sylph, while helping the human to perfect his or her spiritual path, also perfects its own spiritual path, and such a sylph becomes transformed to a seraph, one of the highest orders of angels. Thus it’s a beneficial partnership for both the human and the sylph. I remember reading “The Emerald Tablets” by Thoth. In it were mentioned these symbols: the angle, the cross, the circle and the vortex. One meaning of this symbolism might be that the Baptismal sylph … the fiery cross … perfects the circle of the heart. In the context of the geography of the world, the angles in the cross represent logical or left-brain thought, the circles represent right-brain thought, and vortical motion represents the movement of the blood through the body and the escape of the human from the trap of time and space, from the world of duality. So the sylph: the training of the left brain, and the understanding of its limitations; the love of the natural world for our own hearts … those things all come together to transform us to the highest that we really are. For more on sylphs and the rite of Baptism, see Link: “The Science of the Sacraments,” by C.W. Leadbeater, http://www.anandgholap.net/Science_Of_Sacraments-CWL.htm .. This entry was posted in 02 – Etheric body / vital body / pranic body, Activations of light, Angelic realm, Axiatonal lines - diamond net of Indra - feeder lines of light, Deals with the devil, Demonic realm, Devas - nature spirits - nature elementals, Egyptian religion, Overcoming mind control through faith (see also 'implants'), Physical body and subtle bodies and tagged activation of light, angle, axiatonal lines, circle, cross, Deals with the devil, demon realm, etheric net, heart energy, mind control, nature spirit, seraph, subtle bodies, sylph, Thoth, vortex on 30 November 2016 by Alice B. Clagett.